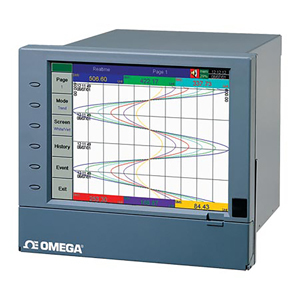 The OMEGA™ RD8900 Series paperless recorder offers real time display of data in a variety of formats on a high resolution (VGA) color TFT display. The user friendly unit with plug & play cards can easily be set to monitor, record, and evaluate any application. The user can access data on the screen, as well as from a remote site via the standard ethernet or optional RS233/422/485 serial interface. The historical data may be stored in a flash ROM, compact flash card, or collected in a remote host PC for evaluation and print out. The unit's compact size saves space and requires less than 7" behind a panel. 참고: Units come complete with operator's manual, panel mounting brackets, basic observer software for non-communication application and 16MB flash card. Recorder offers ethernet interface as standard. To include RS232/422/485 communications add “-RS” suffix and add $145 to price. Feature may be field installed by ordering RD8900-RS. To include counter/totalizer math functions add “-MATH” suffix and $270 to price. Standard software provided with recorder supports transfer of data and recorder configuration only via the memory card. User must have a memory card reader (not provided) connected with the host computer. The data may be read, analyzed, printed or transferred via an Excel type file to another application. The RD8900-SW2 allows above, plus supports real time monitoring and configuration via the communications port. Software is Windows 98, NT, 2000 and XP compatible.